Today is the last day of the year. Yes, yes, I know we’re still in November, and the calendar doesn’t change for another 33 days. But, today is truly the last day of the so-called Christian year (sometimes called the liturgical year or the church year). The yearly cycle of worship, Scripture, and prayer that centers in the life of Jesus is coming to an end. Tomorrow, a new year begins with the season of Advent. In today’s devotion, I thought it would be good to focus on Advent so as to help you get ready for observing this four-week season of the year that starts tomorrow. At the bottom of this devotion, you’ll find a number of resources to help you understand and celebrate Advent. You may be especially interested in an Advent devotional guide I wrote a few years ago. This guide is meant for gatherings of families and friends, but you can use it on your own if you prefer. If you’re interested in this or the other resources, just follow the links at the end of this reflection. Psalm 130 helps us get ready for Advent by highlighting two of its most profound themes: waiting and hoping. Even as the psalmist waits for the Lord with his whole being, so do we, especially in Advent. We remember the Israelites as they waited for the coming of the Messiah. We also attend to our waiting for the second advent (from the Latin word adventus, which means “coming” or “visit”) of Christ, when he will fully and finally usher in the kingdom of God. As we wait, we do so with hope, just like the writers of Psalm 130. Our hope is not wishful thinking or mindless positivity. Rather, it is based solidly on the word of God, on his revelation in Scripture and on his promises. Thus, our waiting is not dour or desperate. Rather, it is confident and even joyful. As Advent begins tomorrow, I invite you to join me and millions of other Christians as we wait hopefully on the Lord together. Perhaps there are particular areas of your life in which you are waiting for God to act. Advent is a season to bring those yearnings before God as we get ready to welcome the birth of our Savior. Are you waiting on God for anything in particular these days? Are you feeling hopeful? Are you wrestling with despair or discouragement? How do you feel about the beginning of Advent? Gracious God, as we come to the end of the Christian year, we thank you for your faithfulness in all things. Tomorrow, as Advent begins, may we turn our hearts toward you in a special way. Help us, Lord, to get in touch with our yearning for your kingdom. Revive in us a hope that will not disappoint. May this season of Advent be a time for us to turn toward you, even as we prepare our hearts for your coming to be among us as the Word Incarnate. Amen. 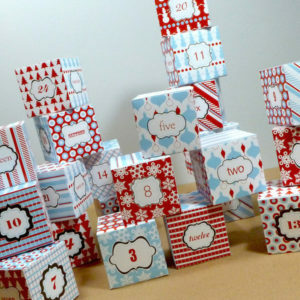 Image Credit: Advent Calendar Boxes by Tina D via CC BY 2.0.